Let’s talk house reinvention. 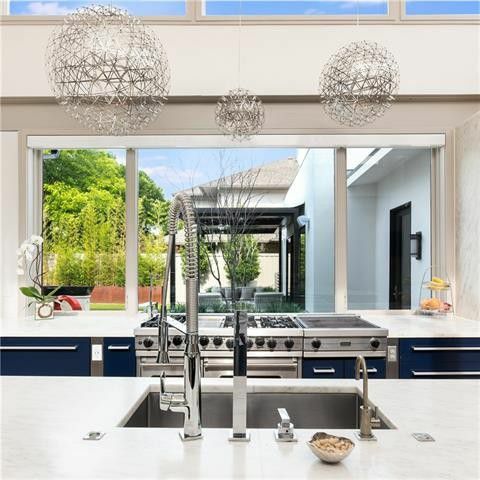 Every few years, homes have to be reinvented, especially when you pass the $2 million mark, and particularly if you want to sell them. 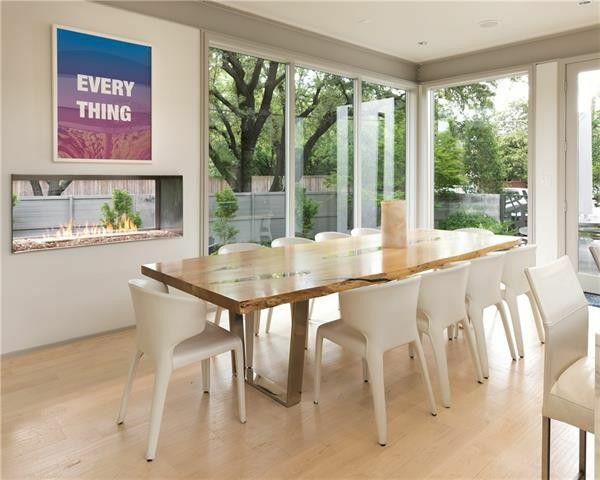 This week I scrolled through a number of dated, boring, multimillion-dollar listings and knew you would be as disinterested as I was. We all want to see something worth seeing! 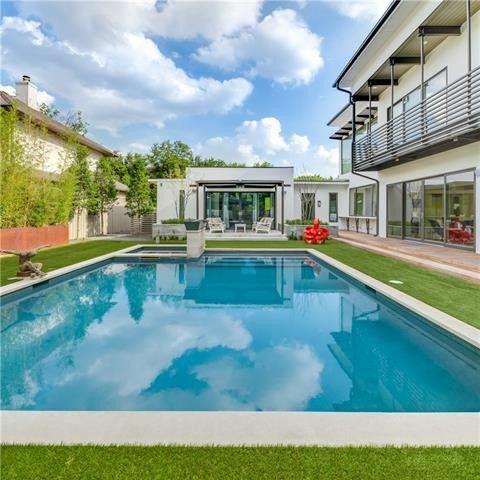 This modern lovely at 6607 Desco Drive has such a new personality that I did not even recognize it, and we’ve written about it at least twice over the past few years. 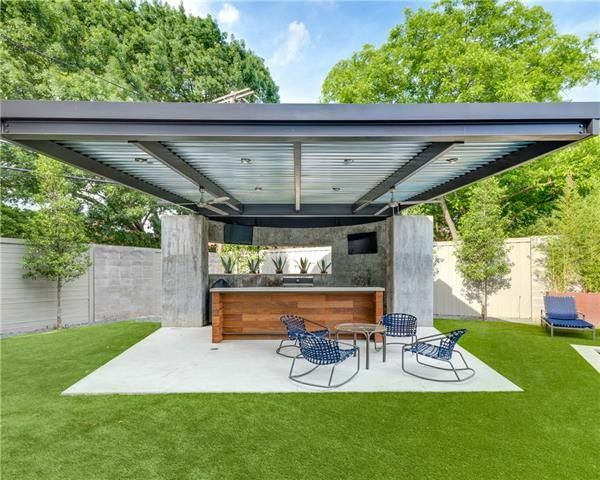 But of course, what we all love about real estate is reinvention, and this Preston Hollow contemporary has finally, I think, found its long-term look. 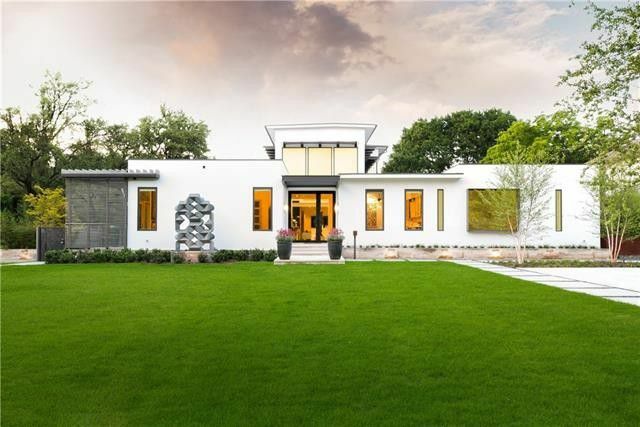 At 5,589 square feet, with five bedrooms, six bathrooms, and one powder bath, there is plenty of room for a large family in this Preston Hollow contemporary. 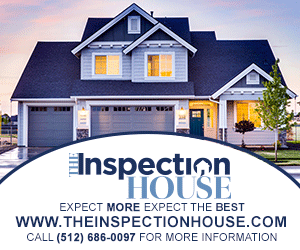 It’s always been a great house, which is why Candy wrote about in 2014 and Jon in 2016. 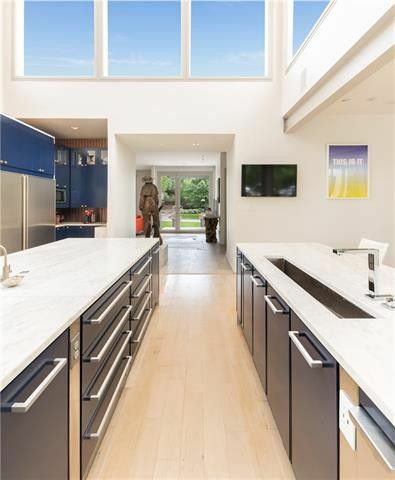 We have always admired the clean, streamlined look of this home. 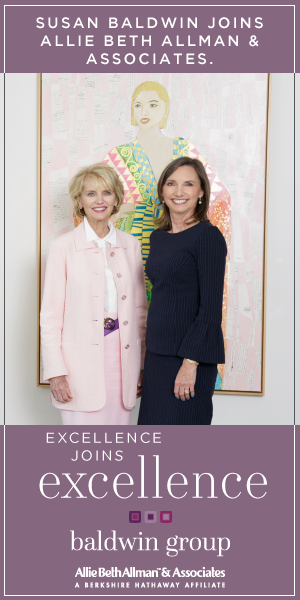 The real beauty of working with a house that’s already been updated and reinvented a few times is that a new owner is only tasked with editing, and further streamlining to their individual taste level. 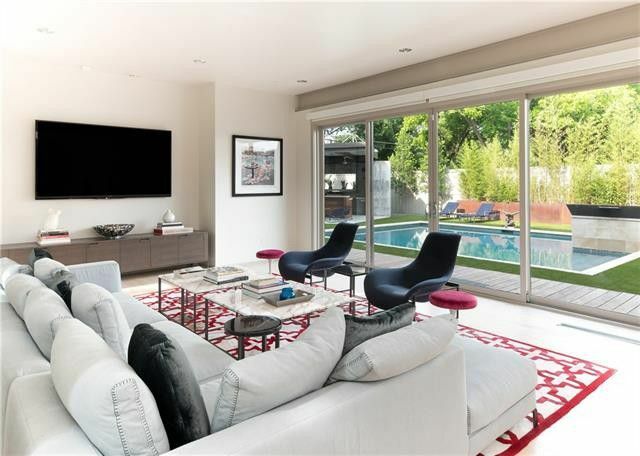 “The present owners opened up a few walls, added a fifth bedroom, reworked the landscaping, and just calmed the look down a bit,” Compass Real Estate listing agent Jonathan Rosen said. 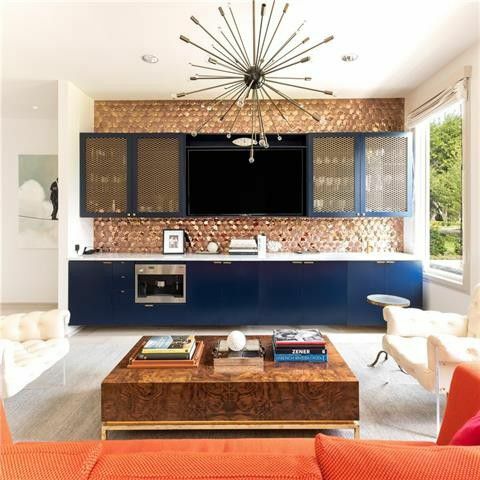 What we generally deem a formal living space, just inside the front door, has been turned into a more informal lounge area with cobalt blue cabinets resting against a gorgeous gold tile wall. 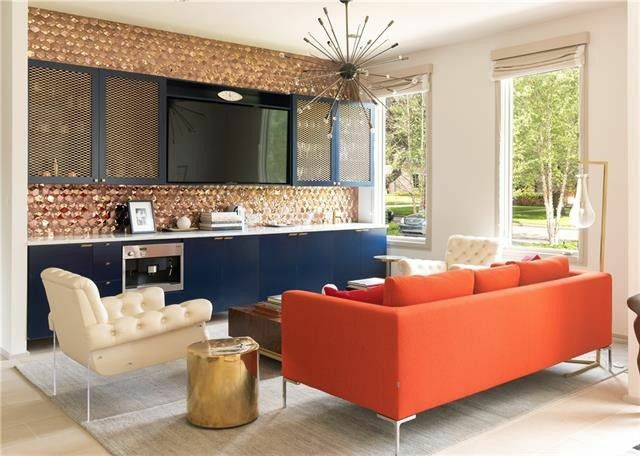 This room is now stylish, flexible, modern, casual, and so much more usable than any formal space. 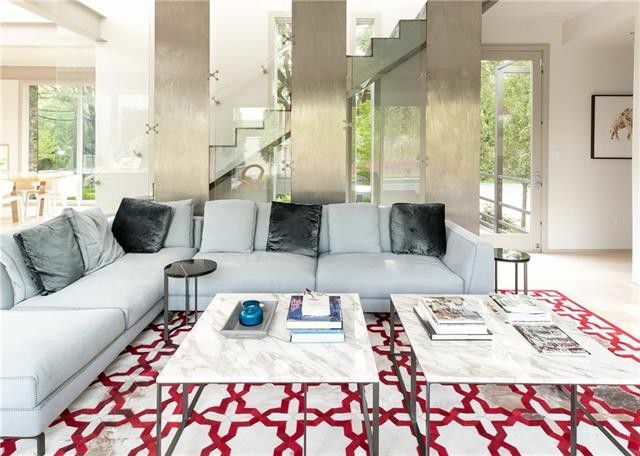 While this Preston Hollow contemporary has open-plan living, there are still very delineated spaces within that plan and a feeling of intimacy. 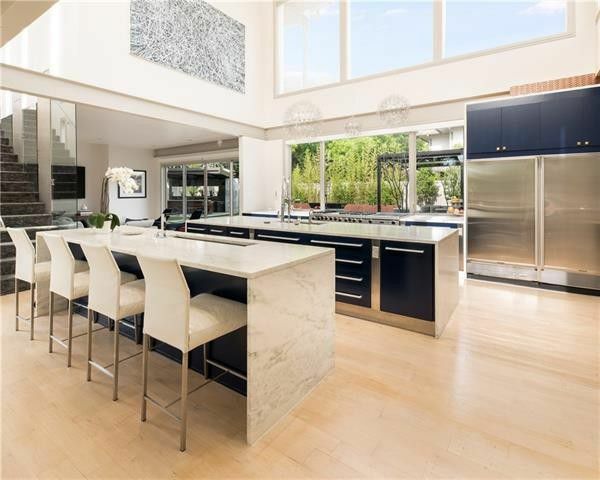 Any kitchen with double islands captures my heart and this kitchen has all that glorious light filtering in through the first level glass doors to the backyard and the second-level windows that offer pure blue skies as your artwork. 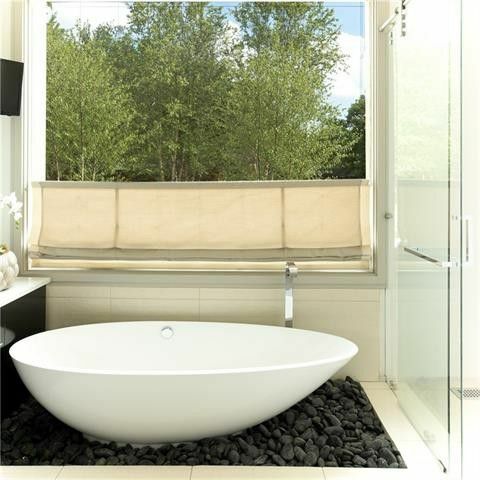 I’d be tempted to put a Corbusier lounger in here, grab a bottle of Veuve Clicquot, and bask in the sunset. 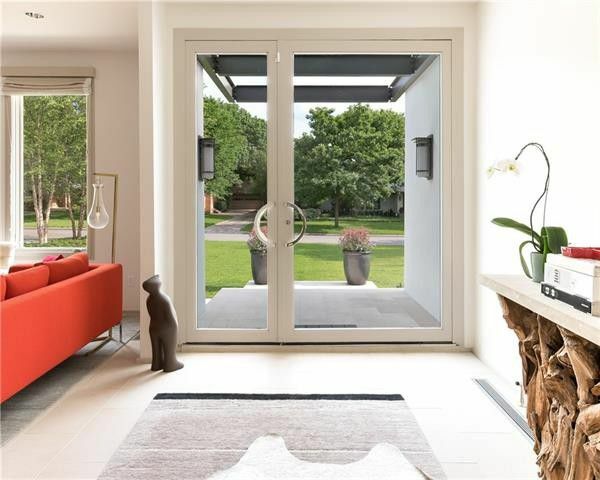 One of my favorite features is the fireplace that opens to the dining area and backyard. You’ll understand what Rosen means by calming the house down when you see the before photo of the stacked stone wall that houses the fireplace. When you have a lot of textures and design elements clamoring for your attention, it can be visually exhausting, and what do we want when we get home? Calm. Period. The dining area before a calming white sheetrock was added. It’s lovely, but you seriously want to count those stones, don’t you? 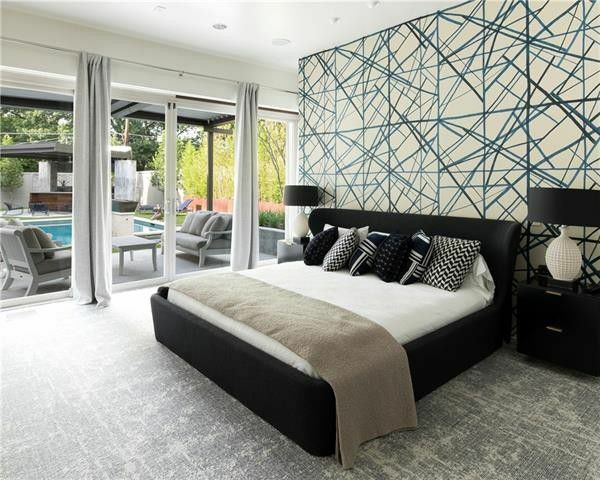 The master bedroom is also reflective of the studied calm the present owners brought to their Preston Hollow contemporary. Again, the before photo is lovely, but there is a lot to see. Now there is only a graphic wall behind the bed, and tasteful simplicity abounds. I’m not a big advocate of covering over hardwoods but in a bedroom, the right kind of carpet oozes luxury and serenity, and of course, it creates a sound barrier. Master bedroom before decor updates. 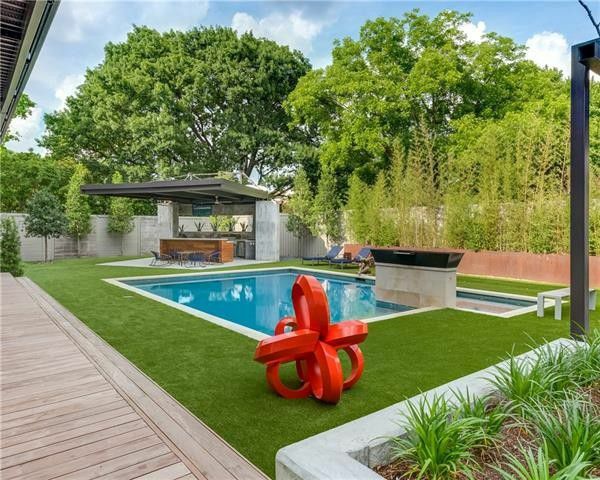 The entire backyard was treated to a layer of artificial turf, meaning zero maintenance — another calming effect! 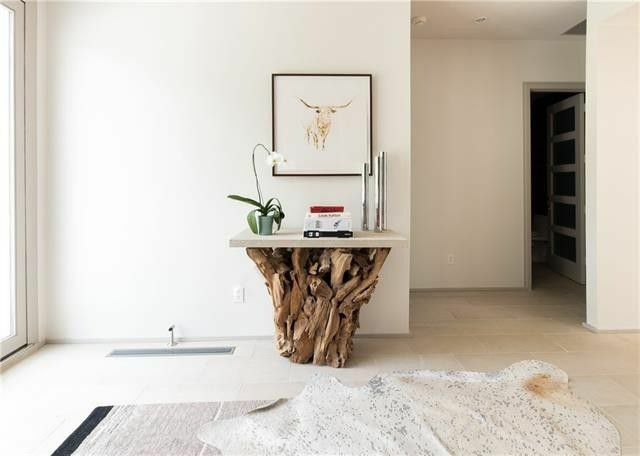 This house has had a lot of airtime because it’s really lovely. We think this latest reinvention is the best yet. 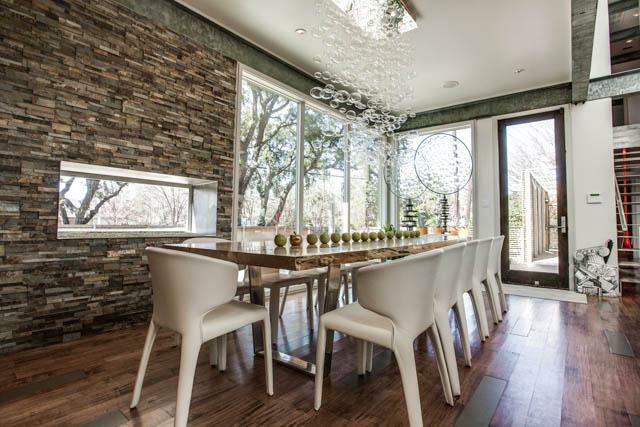 Rosen has this Preston Hollow contemporary listed for $2.795 million.